Discover the many places in Brighton & Hove where you can find low-cost meals, share meals or get involved with a food-sharing project. We want to see Brighton & Hove become the city that cooks and eats together as cooking and sharing a meal with others is great for wellbeing and happiness. Visiting a lunch club or other shared meal setting, or sharing food with a neighbour, can be a good way to save money and bring people together. In Brighton & Hove there are lots of opportunities to get involved with cooking projects, eat with others or volunteer to help others get together to share a meal. Crisis options: what if you have no food or money? During the evenings and weekend, you can download a list –Places to go for free or cheap food – of places which offer free or very low cost meals. Many are targeted at homeless or vulnerably housed people but are accessible by others. Lunch clubs and shared meals in Brighton & Hove serve nearly half a million affordable meals a year. You can search using our directory or It’s Local Actually where you can search by postcode choosing the ‘lunch club’ category. You can also download a list of Lunch clubs – updated 2018 produced by the city council. Very low cost meals for young people (ages 13-25) are offered at the YPC Cafe 69 Ship Street, Brighton, BN1 1AE, 01273 230130. Open Monday: 4pm – 7pm, Wednesday: 3pm – 6pm and Thursday: 4pm – 7pm. The Real Junk Food Project operate on a “Pay as you Feel” principle, which allows patrons to give back either financial donations, their time, energy or skills as a way of accessing the food. All the food used would have otherwise ended up in landfill. Brighton Unemployed Centres Families Project, Tilbury Place, (Tarner area) offer cheap vegan lunches for everyone, and for people in crisis may offer a free meal or emergency food parcel. Open weekdays 10:00 – 16:30. There are several community cafes which offer affordable snacks and meals. Casserole Club put puts older people in touch with a neighbour who can come round to their home to drop off a free, wholesome meal and have a friendly chat. Food Sharing apps and facebook pages can help people share unused ingredients with each other. 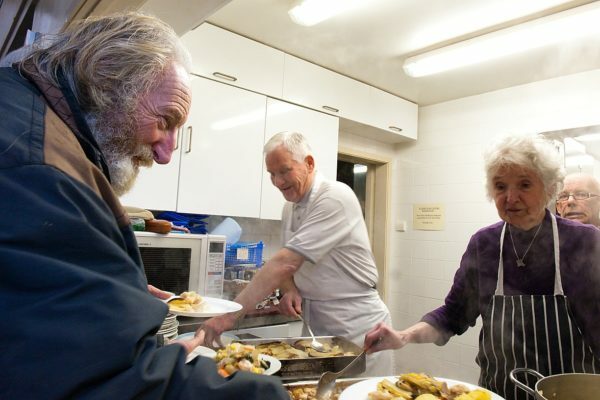 Many community cafes, shared meals and lunch clubs welcome volunteers, who often benefit from a free meal. Some food growing projects offer a meal or a share of the harvest to people who come to volunteer. Free and cheap food in Brighton and Hove (2019).